There is always talk of various magical items that help you get by the troubles of modern living. Some witches enjoy their flying brooms. Wizards often have their camouflaging cloaks. Unfortunately, we Regular Joes don't often have such a mystical luxury. But, we have come upon a couple folks who are wonderful at their wandering while hidden in plain sight! If only we knew how that Waldo did it, managing to disappear and leave us all wondering where the heck he went! Well, ask and ye shall receive. Feel the mighty power of invisibility when you pop your top with this Deluxe Waldo Hat. This simple cap might just look like a candy-stripe cap with a puffy red ball topper, but something about it is what keeps our favorite blending bloke capable of hiding no matter how hard we look! Feel like you're the man everyone's looking for with this comfy cap! When you're donning this iconic Waldo Hat, you've instantly got the invite to join in with all the other folks who manage to escape our eyes. 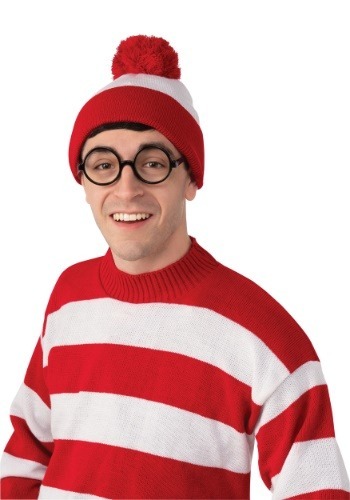 Join up with the Invisible Man, Desperately-Sought Susan, and Carmen SanDiego when you're rocking the Waldo look. Just be sure to wave a hand at us to give us a chance to find ya!